A modder has created a first-person mod for Age of Empires 2, dubbed Overreign. In the videos on their Youtube channel, the developer, who goes by Spriteblood, showcases the game’s classic blocky aesthetic from the new perspective, complete with classic models reworked to suit first person. Members of the Age of Empires community have been hugely receptive to the mod, which appears to take inspiration from other strategy games such as Natural Selection and Rise and Fall: Civilisations at War. 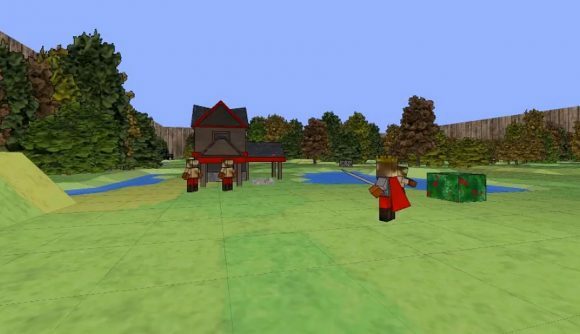 Though it may not necessarily prove popular amongst AoE2 purists, the community is already known to be keen on modding the 1999 classic game – with other mods including fantasy settings, new armies and some whacky game types. It seems only fitting that after 20 years of modding a game with an isometric view, someone has thought to rethink the way it plays entirely. Spriteblood has already proven in their videos that the mod works within the game’s multiplayer mode and has demonstrated how the game’s units learn to ‘follow’ the player character, effectively eliminating the need for a cursor. Personally, I’m excited to see how late-game battles look and feel from the new perspective. It is possible that a new look and play-style for the strategy classic may attract a new audience of players who are put off by isometric games. The first-person perspective has already proven it works across genres, and as a player of real-time strategies, I can vouch that there is a demand for a slight rethink when it comes to the way the games are set up. It’s great to see that a game released over 20 years ago is still being unpacked and reworked by modders, though it does make me wonder – what games from today will be still be modding in twenty years? After all, Skyrim already has everything in it you could possibly imagine.